With more than 100 children experiencing bereavement a day, this text offers a valuable insight in how to sustain and build resilience with children who are grieving. It is a helpful book exploring grief and bereavement with children. It is easy to read and offers a good understanding of grief with lots of practical suggestions of how we might support children through the grieving process. The introduction and opening chapter describe the changes and challenges of grief and set a helpful context of how children process grief. The author draws on important research and theory that acknowledges continuing bonds and the value of maintaining relationships with the dead. 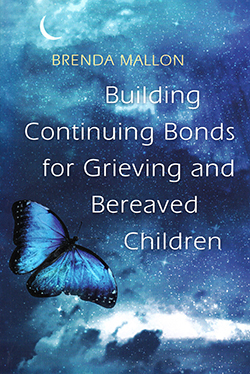 Subsequent chapters explore the importance of remembering special days and Brenda Mallon provides advice and ideas of how to nurture legacies and make memories. There are some beautiful ideas about harvesting stories and an abundance of creative approaches, from art and poetry to journal writing, to support children in the process of grief. There is a helpful chapter on dreams, recognising the emotional and spiritual life of children, which is often overlooked in the literature. The book is referenced well and the resources section is particularly useful. It is valuable to all those whose work involves contact with bereaved children.